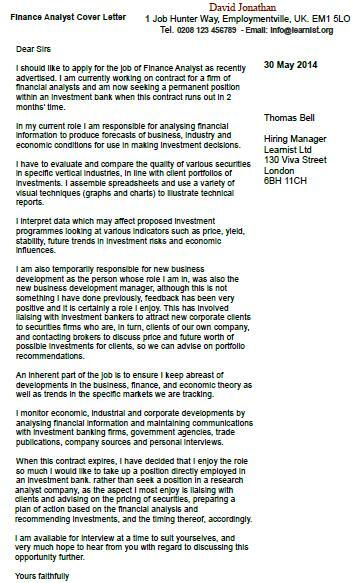 Cover letter example for a Finance Analyst job vacancy. Amend as suitable and apply for the latest online job vacancies. I should like to apply for the job of Finance Analyst as recently advertised. I am currently working on contract for a firm of financial analysts and am now seeking a permanent position within an investment bank when this contract runs out in 2 months’ time. In my current role I am responsible for analysing financial information to produce forecasts of business, industry and economic conditions for use in making investment decisions. I have to evaluate and compare the quality of various securities in specific vertical industries, in line with client portfolios of investments. I assemble spreadsheets and use a variety of visual techniques (graphs and charts) to illustrate technical reports. I interpret data which may affect proposed investment programmes looking at various indicators such as price, yield, stability, future trends in investment risks and economic influences. I am also temporarily responsible for new business development as the person whose role I am in, was also the new business development manager, although this is not something I have done previously, feedback has been very positive and it is certainly a role I enjoy. This has involved liaising with investment bankers to attract new corporate clients to securities firms who are, in turn, clients of our own company, and contacting brokers to discuss price and future worth of possible investments for clients, so we can advise on portfolio recommendations. An inherent part of the job is to ensure I keep abreast of developments in the business, finance, and economic theory as well as trends in the specific markets we are tracking. I monitor economic, industrial and corporate developments by analysing financial information and maintaining communications with investment banking firms, government agencies, trade publications, company sources and personal interviews. When this contract expires, I have decided that I enjoy the role so much I would like to take up a position directly employed in an investment bank, rather than seek a position in a research analyst company, as the aspect I most enjoy is liaising with clients and advising on the pricing of securities, preparing a plan of action based on the financial analysis and recommending investments, and the timing thereof, accordingly. I am available for interview at a time to suit yourselves, and very much hope to hear from you with regard to discussing this opportunity further. People often wonder how long their cover letter should be. It is difficult to tell, but it usually depends on the type of job. If you have years of experience and lots of qualifications to talk about, avoid going into lots of detail about everything if you’re applying for a shop assistant position, for example. However, a finance analyst cover letter may require an extra couple of paragraphs. If you have the proper qualifications and some experience, you can easily fill around four good paragraphs convincing the employer that you’re the right person for the job. You may have a lot of competition as well, so use your cover letter to really brag (in a good way!) about your good points.